When replacing building signage it’s always cool to uncover a building’s previous occupants’ livery trapped in a time capsule behind the hoarding. But here’s a story out of historic Tenterfield, New South Wales that takes that to a whole other level. Of course, if you’re looking for a team of industry-leading professionals to upgrade, repair or maintain your building signage contact Sign Here Signs today. Momentum behind the project to establish the Tenterfield CBD as a National Monument to the federation era is building with public meetings soon to be called, and the stories which will contribute so greatly to that effort could be sitting just under a layer (or three) of paint. 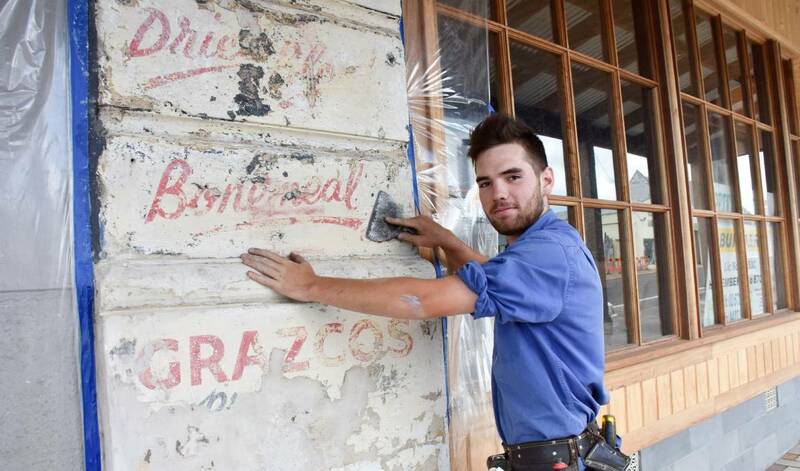 Builder Peter Sullivan and his crew have picked up some new old skills after attending Sydney workshops on brick restoration, but it was careful paint removal off the facade of a building they’re working on at 124 High Street that revealed a slice of Tenterfield history. 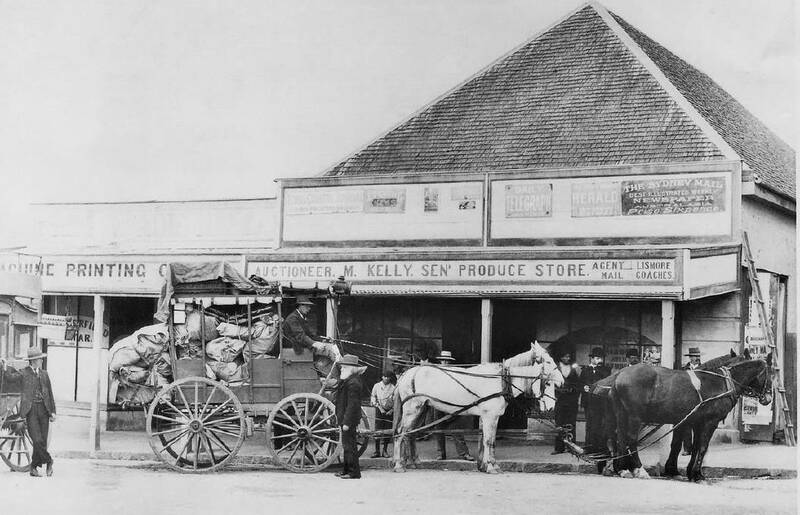 Top: Mortimer Kelly in front of 124 High Street, one of the oldest buildings in Tenterfield, in around 1911. Photo courtesy of Christine Bowler. Above: Keiran King is part of the Peter Sullivan crew carefully restoring one of Tenterfield’s oldest buildings, uncovering some gems along the way. Mr Sullivan along with Pat Skinner, Steven Curry and Kieran King have been using environmentally-sensitive, citrus-based paint remover in the recovery and conservation of the old brickwork. Careful removal of layers of paint on the front of the building has revealed very old signs dating back to when the building was used as a Grazcos Produce Store, probably sometime after Mortimer Kelly’s death in 1926. The signs promote a range of ‘eco-friendly’ fertiliser products of the time, presumably sourced locally, including meatmeal, dried blood, bone meal and ‘salt blocks – all sulphurised”. Mr King was chief worker in a process that saw the special paint removal applied and let rest for 24 hours to soften the paint, and then the whole crew got to work on removing the three or four layers of paint to reach the signs. The paint removal process took around four hours. In a strange coincidence, the big reveal comes just ahead of a gathering of former GRAZCOS employees on March 9 in Sydney, marking 100 years since the co-op was founded by shearers in 1919. The old signs will be retained to illustrate an aspect of the town’s history if it suits the building’s eventual use. Otherwise they will be recorded and covered with a special coating which can be reversed in future if so desired.